This post was written as an assignment for Professor Cindy Shearer’s Aesthetics of Value course. In Aesthetics of Value, students explore their arts heritage and inquire into the values that guide their creative work. I came across an old photocopy of a definition of the word “artist” around the time I was beginning my MFA at CIIS. I hung it on the wall near my electric fireplace as a reminder to myself about what I was working towards. I then proceeded to forget that it was there until a few weeks ago when I reread the page while working on my aesthetic statement for Cindy Shearer’s "Aesthetics of Value" class. After spending weeks reading, thinking, and writing about beauty and how it relates to my work, this encyclopedic entry which once seemed evocative of some identity larger now seemed dry and misinformed. It struck me now that this attempt to explain “artist” positioned her as an outsider to some kind of normal standard. I underlined phrases such as “governed by imagination,” “individual style,” “create during moods,” “haphazard,” “sensitive, aware and alert,” “live in accordance with their own natures,” and “tolerated by society.” All it had to offer me now was a list of buzzwords used by people looking at artists and not a way to see oneself as an artist. It bothered me that I would have chosen this limited definition to represent my artistic identity. However, I think I chose it as a challenge to myself to define my relationship to the framework of an identity this paper offered. Engaging with it again made me realize how far my understanding of myself as an artist has come in the last few months. After rereading it, I left the paper there on my wall so I could use it to reflect on what is it that I now thought about what it is to be an artist. I believe it is an innate human need to express ourselves through artistic means. I don’t think I'm special for feeling drawn to the power of art, but in this world right now I am unique for continuing to create art. It was once suggested to me that artists don’t apologize for anything in what they do. And that really stuck with me: I went home and wrote the phrase “Artists Don’t Apologize” on top of the text. I think part of making a life in art involves searching for a way of expressing something authentic about yourself. What I have learned this last year is that first you have to find a way to hear yourself and then make the space for others to hear you. 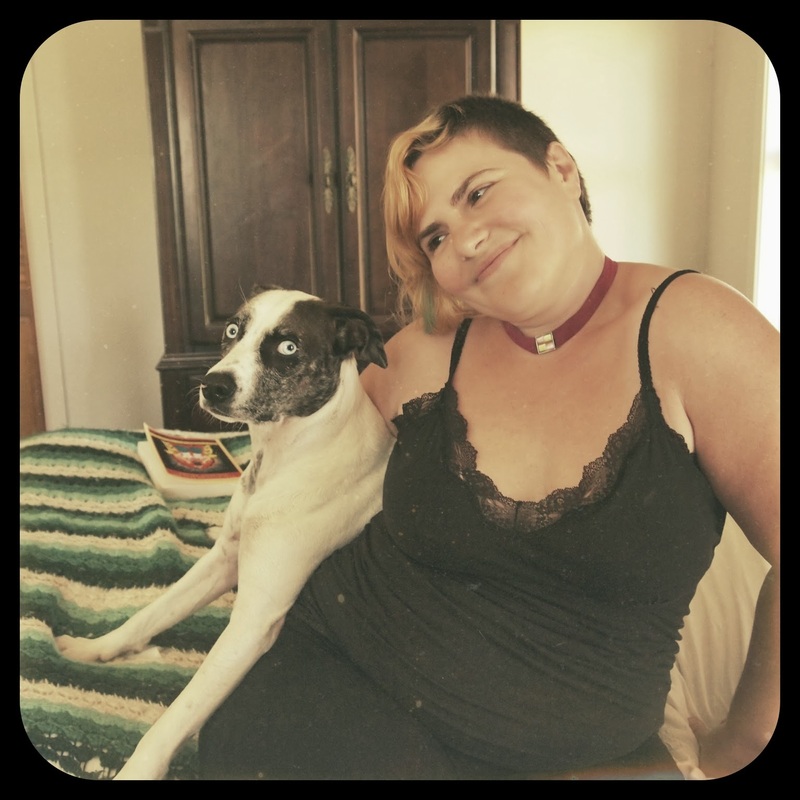 Both seem incredibly challenging to me but going through this MFA program I feel like I am being walked through the process of setting up my life to be able to hold that kind of authenticity in a larger way than I had been able to conceive of before. "Our creativity will be our sensory system. And through this sensory system we will be overflowing with energy, touching the hearts of people, and feeling their feeling, and filling their emptiness. We will act great and our flow will fulfill the gratefulness in the hearts of others. It will be a new relationship. We will create a new humanity which will have the new sensory system and thus we will establish the Age of Aquarius. This is the fundamental character you have to learn by heart"
I was assigned to do a peice working with symbols that relate to my ancestry. My father's family traces back to a town near where the Black Madonna of Czestochowa is kept. The origins of the icon and the date of its composition are still hotly contested among scholars. The difficulty in dating the icon stems from the fact that the original image was painted over after being badly damaged by Hussite raiders in 1430. Medieval restorers unfamiliar with the encaustic method found that the paints they applied to the damaged areas "simply sloughed off the image" according to the medieval chronicler Risinius, and their solution was to erase the original image and to repaint it on the original panel, which was believed to be holy because of its legendary origin as a table top from the home of the Holy Family. The painting displays a traditional composition well-known in the icons of Eastern Orthodoxy. The Virgin Mary is shown as the "Hodegetria" ("One Who Shows the Way"). In it the Virgin directs attention away from herself, gesturing with her right hand toward Jesus as the source of salvation. In turn, the child extends His right hand toward the viewer in blessing while holding a book of gospels in His left hand. The icon shows the Madonna in fleur de lys robes. 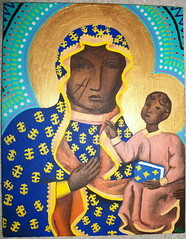 In Vodou, it is believed that a common depiction of Erzulie has its roots in copies of the icon of the Black Madonna of Częstochowa, brought to Haiti by Polish soldiers fighting on both sides of the Haitian Revolution from 1802 onwards. In her Petro nation aspect as Erzulie Dantor she is often depicted as a scarred and buxom woman, holding a child protectively in one hand and a knife in the other. She is a warrior and particularly a fierce protector of women and children. In Santeria, this image is referred to as Santa Barbara Africana.